Former Hop director of film Bill Pence founded the Telluride Film Festival in 1974. 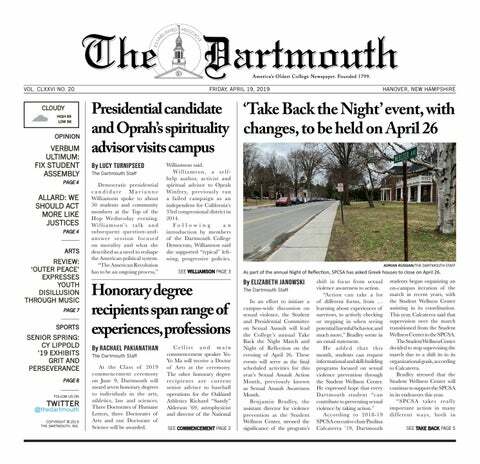 For the last 33 years, the connection between the festival and Dartmouth College has resulted in an enduring week-long event. Johanna Evans, Hop film programming and operations manager believes part of the appeal of the festival comes from its accessibility. Dartmouth Film Society director Jordyn Fitch ’20 attended the Telluride Film Festival in Colorado this year as a part of its Student Symposium and said she believes another major appeal of the festival is how early some of the film screenings are compared to the films’ release dates. “It’s cool to be able to tell your friends you saw movies before everyone else did,” Fitch said. This year, the festival is kicking off with “Can You Ever Forgive Me?”. The film features Melissa McCarthy as Lee Israel, the real-life struggling author who turned to forgery as a means to keep afloat. Based on Israel’s memoir, the drama shows how the struggling writer began to make a living selling forged letters by deceased playwrights and novelists. Despite being a drama, “Can You Ever Forgive Me?” does not take itself too seriously, Evans said. “The Front Runner” screens on Sept.15 and features Hugh Jackman as Senator Gary Hart, the 1988 presidential candidate who had his campaign derailed by tabloid allegations of an affair with Donna Rice. On Sept. 16, “The Favourite,” featuring Rachel Weisz and Emma Stone, will depict the two women’s battle to become the favorite courtier of Queen Anne, played by Olivia Colman. The next three movies in the Telluride sequence are foreign language films, which Evans believes will provide an eye-opening and pleasantly unusual experience for American moviegoers. “Border,” showing on Sept. 17, kicks off this series of foreign language films. The Swedish movie tells the story of Tina, a troll-like customs officer with a special ability to sense guilt. “Border” focuses on her relationship with a similar man who believes that they are both beautiful. Fitch recalled the film being extremely buzzworthy during the festival in Colorado. “That was one that everyone was talking about at the festival,” she said. It is also a film that Evans is excited for those in the Dartmouth community to experience. “Girl,” a Belgium fill, will screen on September 18. “Girl” follows Lara, a transgender teenager who is attempting to train to be a ballerina while simultaneously undergoing a medical transition. “A lot of [the film] is about trying to balance all the different parts of yourself and seeing how far you can go without making compromises,” Evans said. On Sept. 19, viewers can see the Italian foreign language film “Dogman.” The plot centers around Marcello, a dog groomer who dabbles in cocaine sales and leads a well-tempered life. This equilibrium is disrupted when Marcello is forced into assisting a robbery. Lead actor Marcello Fonte received the Cannes Best Actor Award for his role in the film. This year, Telluride at Dartmouth is featuring seven films as opposed to the traditional six. The seventh bonus film is “Free Solo,” screening on Sept. 20. The documentary is about Alex Honnold, a climber who is known for “free solo climbing,” or climbing without any ropes. Because of his love of climbing and desire for a challenge, Honnold attempts to scale El Capitan in Yosemite — a 3,000-foot wall — without any protection. The film will be a taste of what is to come during Mountainfilm on Tour, a screening of a series of short films centered around the idea of adventure, at the Hopkins Center. Ultimately, Evans said that the festival experience is a way for viewers to surrender themselves to film. “You don’t know how you’ll feel [at the festival], and that’s a great way to experience film,” she said.